They say you can't go home again, but that's entirely untrue if you're only about five hours away. Since that's exactly true in our case, Erica and I will once again be driving up I-70 to our old stomping grounds, this time to attend (and in Erica's case, table) at PIX, the Pittsburgh Indy Comics Expo. PIX started last year, but has the unfortunate timing of being opposite the Richmond Zine Fest, which is normally where Erica and I would have a table for Erica's zine distro. However, this year, after much discussion, we've opted to to to the comics show instead of the zine show. Richmond Zine Fest is a great event, and normally we'd be there. However, between the chance to see old friends and family in Pittsburgh and the fact that this is a comics-centric show tipped the scales in its favor. Since this is my first time going to this show, I do not know much about it. It seemed to go well last year, and its location in the Strip District of Pittsburgh, where there is a lot of weekend shopping for produce and other small goods makes it a good location for the Expo. People who want to shop non-chains and get small, quirky items are a good crossover market for comics, I think. I am not sure if it would be better to be in East Liberty, where there are several other festivals going on, or if that might cause too much competition. Regardless, I'm looking forward to having a show in Pittsburgh that's geared towards comics, as opposed to media, like the Pittsburgh Comic Con, which I never bothered to attend. I obviously recommend you stop by Erica's table to not only say hello, but to see what she has at the distro. Beyond that, here are some other folks that I think are worth checking out. John Porcellino stretches across the zine-comic divide with his long-running series King Cat. Published by Drawn and Quarterly into a few books, Porcellino still self-publishes his comics in the mini format, which I think is pretty impressive. He is a very soft-spoken man who thinks deeply about the world around him, and that shows in what I've read of his work. Erica is a huge fan. Don't leave PIX without getting something from Porcellino. Rob Rogers is the local editorial cartoonist for the Pittsburgh Post-Gazette and is about as liberal an editorial cartoonist as you're going to find. His comics are insightful and at times enraging (especially if you feel sympathy with the Tea Party). I've heard him talk before, and he's an excellent speaker. I find editorial cartoons a bit too topical for my taste to read in collection, but if you are all a fan of the genre, his new book is a must-own. Jim Rugg is probably best-known in indie comics for Afrodesiac, but he also did two volumes of work for the late Minx comics (which apparently sold quite well for him) and has a versatile style that works in a lot of genres. A Pittsburgher himself, Rugg is one of my favorite creators. Tom Scioli is one of the best artists I've seen at doing work that looks like it might have come from Jack Kirby himself. Specializing in space epics, Scioli is going to be working on a new project with Ad House Books, coming in 2012. If you like old-school comics, you'll find much to like in Scioli's work. In what may be our final meeting at a show this year, Rafer Roberts returns to PIX for a second year. Roberts is the brains behind Plastic Farm, one of the best self-published comics I've read. He's also a friend of mine, and an all around good guy. If you like things creepy and weird, look Rafer up. Heck, look him up anyway. Try something new! 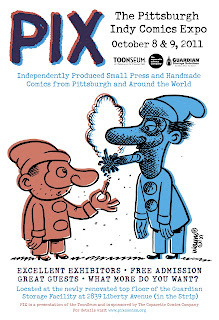 The folks behind Angry Gnome comics will be at PIX. I read and enjoyed their anthology of gotcha stories, Short Stack, and I wouldn't mind seeing what else they have this time around. Their comics might make a perfect Halloween present for the horror fan in your life. Dave Wachter does amazingly good sketches, some of which are collected for you to buy and be happy to look at over and over again. I'd recommend his Monsters book, given the time of year. If you have some cash to request a commission, take the plunge! It will be well worth it! PIX will be held Saturday October 8th and Sunday October 9th from 10am to 5pm on both days. I hope to see you there!